Fidelity RAD12 Portable six transistor radio housed in an imitation teak wood plastic case with aluminium fascia. 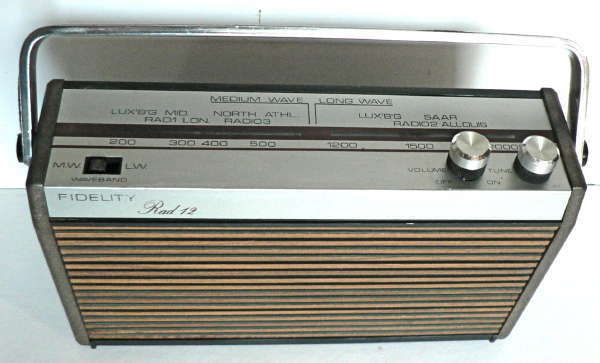 This lightweight radio was first introduced in May 1968 and was priced at 9 gns (�9s.0d or �45 in today's money). It covers 188-555 metres on the medium waveband and 1200-2000 metres on the long waveband, selected by a slide switch. The tuning scale has two linked pointers, one for each waveband. Earphone and external aerial sockets are on the rear. 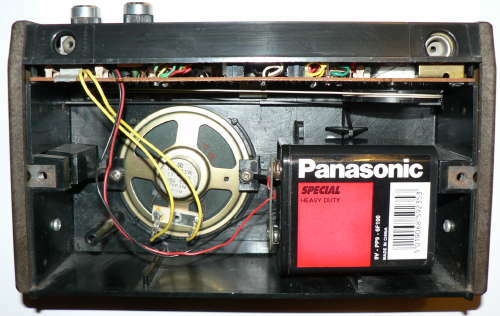 The set is powered by a single 9Volt PP9 battery. The transistors are as follows BF194B, BF195C, BF195D, BF194, BC149, AC127, and AC128. This set working and was made by Fidelity Radio Ltd. London W11 England in about 1969.